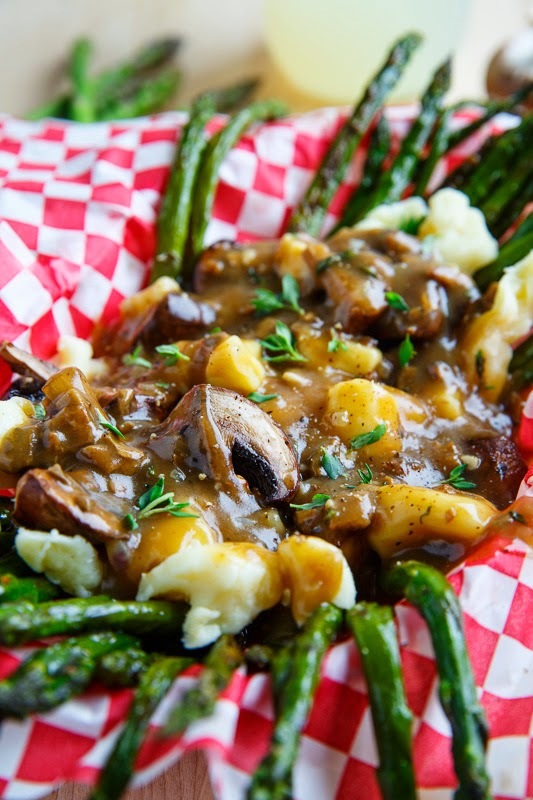 A tasty summer poutine with roasted asparagus and mushrooms topped with cheese curds and a hot mushroom gravy. 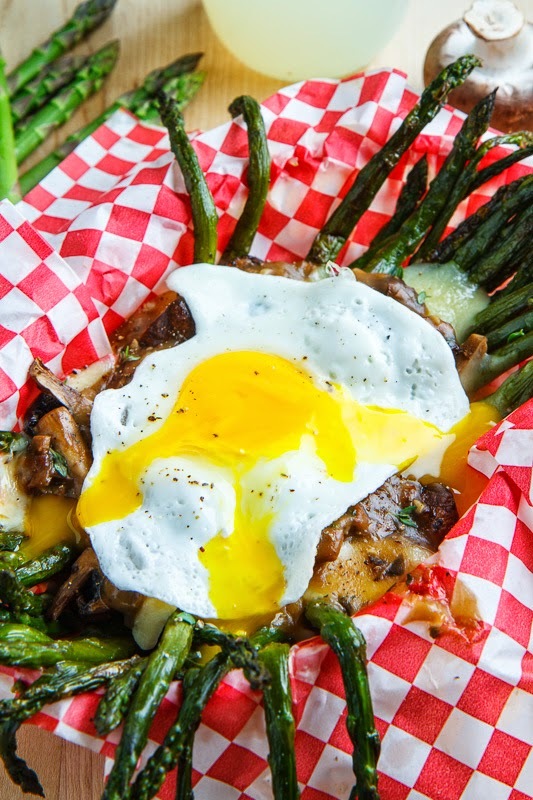 Asparagus and mushrooms are a fabulous combination, one that I never tire of using, and my latest creation is an asparagus and mushroom poutine. Poutine is a Canadian dish where french fries are topped with cheese curds and gravy. I figured that the asparagus would make perfect ‘fries’ and I could toss the mushrooms in along with the cheese curds and top everything off with a tasty mushroom gravy. I always enjoy roasting vegetables, it helps bring out more flavour, and so I decided to roast both the asparagus and the mushrooms for the poutine. For the gravy I started things out by soaking some dried porcini mushrooms in broth and I used them along with some shallots, garlic, thyme and soy sauce to ensure that the gravy was full of flavour. 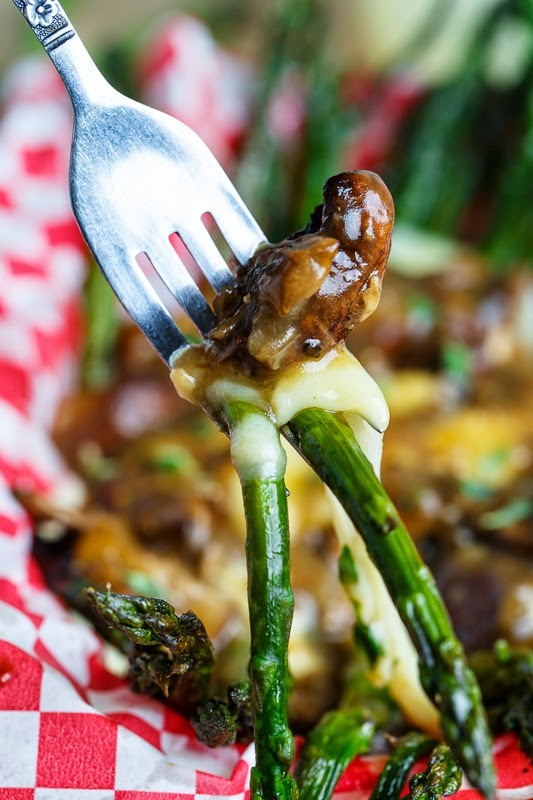 I have too say that this is one tasty poutine; I mean, you really cannot go wrong taking an amazing combo like asparagus and mushrooms and topping them with cheese and a tasty gravy! Add a fried egg and make a meal out of it! Just look at that runny yolk! Bring the broth and mushroom to a boil, turn off the heat and let sit until the mushrooms are tender, about 15-20 minutes, before straining the mushrooms, reserving the broth, and chopping the mushrooms. Meanwhile, toss the asparagus and mushrooms in the oil, salt and pepper, place on a baking sheet in a single layer and roast in a preheated 400F/200C oven until they start to caramelize, about 20 minutes, mixing half way through. Meanwhile, melt the butter in a pan over medium heat, add the chopped mushrooms and cook until they start to caramelize, about 5 minutes. Add the shallot, garlic and thyme and cook for a minute. Mix int the flour and cook for another minute before mixing in the broth and soy sauce, seasoning with salt and pepper and simmering until it thickens, about 5 minutes. 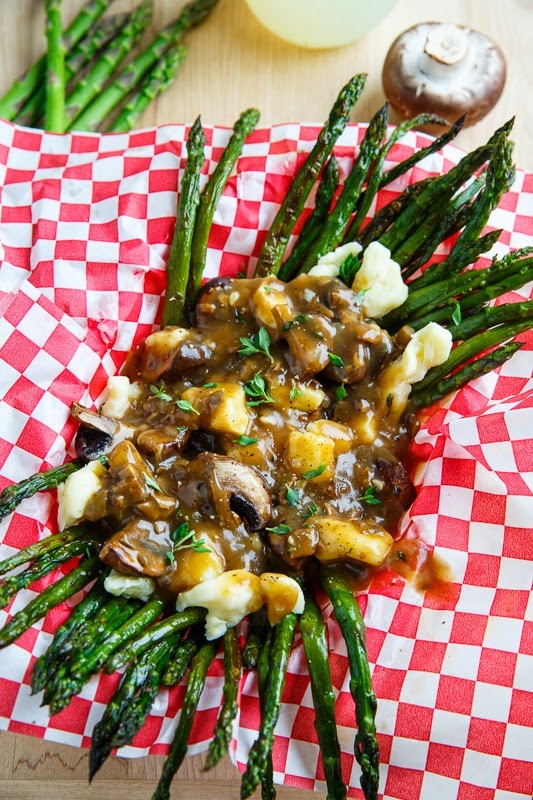 Plate the roasted asparagus and mushrooms, top with cheese curds and hot gravy and enjoy! This is the best thing I've seen all day!! Holy awesome! I love this healthier version Kevin- yum! What a great recipe Kevin! Love those egg shots!! That looks delicious. I love anything with a fried oozy egg on top, especially if it tops something green and colorful and healthy. This is nothing short of amazing! I have to have it!! This is a brilliant recipe Kevin. I love it! OMG!!! I need to try this-stat. It looks crazy good. oh my gawd, Kevin! I love poutine!! love this spin on it and love the fried egg!! 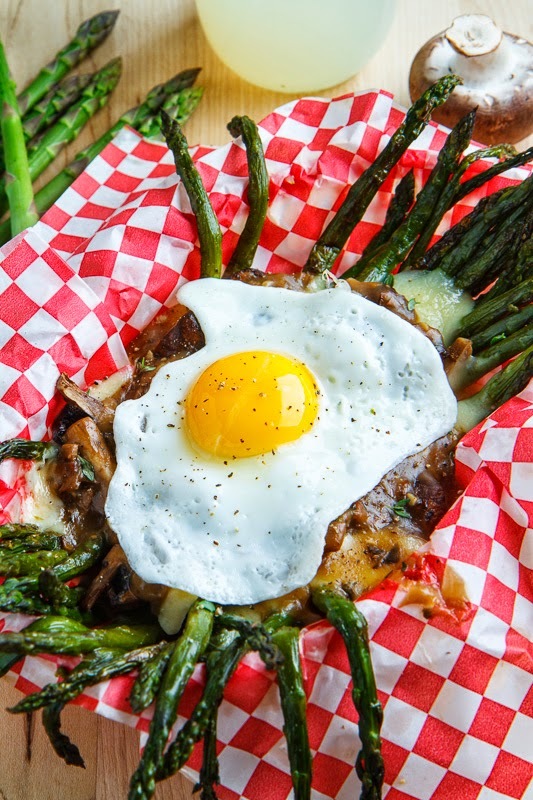 Put a fried egg on anything and I'm swooning. can't wait to try this! Beautiful kevin! You always have amazing recipes! Going food shopping tomorrow…definitely buying the makings for this dish! Oh dear! I've just died and gone to heaven! This will be my dinner every.single.day next week. You've outdone yourself this time Kevin. Fantastic!